Design the perfect multi-city day trip to visit Osaka, Kyoto, or Nara thanks to this customizable, 8-hour or 10-hour private tour. Enjoy access to a private vehicle and English-speaking driver as you create the ultimate day-long excursion, picking among top-tier highlights like Kyoto’s Kinkaku-ji Temple and Nara’s Great Buddha statue. Receive a morning pickup from your hotel in Osaka. Your exact pickup hour is flexible and can be coordinated in advance with your host. What you see and do after that is entirely up to you. Travel aboard an air-conditioned vehicle equipped with Wi-Fi as you enjoy the perfect day of exploration in the Kansai region. Depending on your interests, you might take a closer look at the thriving food and drink scene in bustling Osaka, or head to ancient Kyoto, where you visit the amazing collection of shrines and temples like Kinkaku-ji or Fushimi Inari Taisha Shrine. Meanwhile, those who plan to stop in Nara won’t want to miss Todai-ji Temple and its giant Great Buddha. Check out the itinerary section below for a complete list of potential trip stops. Your driver can help recommend the most efficient route and suggest potential highlights if you need help deciding. 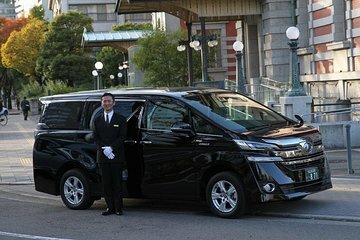 At the end of your multi-city excursion, you’ll be dropped off at your Osaka hotel in the late afternoon or early evening.